Our Masters in Political Ecology is slowly shaping into reality! We have now formally presented the proposal to the Autonomous University of Barcelona which is in the process to officially launch it. This is a presentation of our Masters and in attachment you will find more detailed information about the courses offered and their content. Soon we will be able to receive and manage applications, we will let you know! This is the first Masters of its kind, and one of the first all in the world in the flourishing field of Political Ecology. 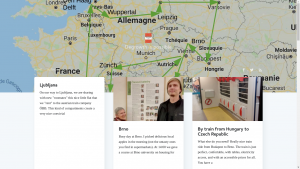 The Masters builds on a successful 7-year series of international Summer Schools on Environmental Justice and Degrowth, two ongoing European Research Council projects on global –in which the Atlas of environmental justice has been created (https://ejatlas.org/ )- and urban environmental justice. And it benefits from the several top researchers that are currently working at ICTA (the Institute for Environmental Studies and Technology) and R&D (Research and Degrowth) in Barcelona, the two institutes co-organizing this program. We live in an era of growing inequalities, poverty and environmental disasters. Environmental and social problems are inter-related. Environmental problems have political causes and political solutions – they are a matter of power and inequality. Addressing climate change calls for system change – our program offers the knowledge and tools for thinking and bringing forward such system change. We aspire to train the next generation of environmental justice activists, engaged civil servants, and entrepreneurs of the new cooperative economy – those who will put in action the best ideas for creating a society that is fair, enjoyable and ecologically sustainable. Barcelona is an international centre for research and action on degrowth and environmental justice. In our masters program, you will get theoretical classes from top scholars in the fields of environmental conflicts, urban gentrification, ecological economics and governance of the commons. Our teachers include well-known names in the field, such as Joan Martinez-Alier, Isabelle Anguelovski and Giorgos Kallis. You will be trained in using methods to conduct qualitative and quantitative analysis of complex problems – such as multi-criteria evaluation, surveys, Q-methodology, and material flow analysis. And you will be taught by practitioners who are experts in their fields, how to facilitate a group process, how to write a policy report or a newspaper article, how to run a social or environmental justice campaign and how to set-up a cooperative. The program focusses on the theoretical, methodological and professional capacity building for young people who want to work in the Social and Solidarity Economy, public administration, Environmental Justice Organizations, think tanks and consultancies. Our graduates will be employable in a variety of positions in the public, non-profit and private sectors. You will be capable of organizing a campaign or launching a lawsuit against a polluting agency or company. You will have the abilities to identify gaps and start a non-profit or a cooperative business that covers real human needs and creates social value. You will know how to approach journalists, pitch and communicate your work to a newspaper, or do an investigative report yourself. You will be able to analyze complex problems using both qualitative and quantitative software and write policy or consultancy reports. Our masters does not lead to a PhD. It is a professional program, a Masters propio, meaning a masters granted by our University. Within Spain (and most of Europe), Masters propios are recognized by the private sector, but do not make you eligible for entering a PhD program. Our program however will be taught at the highest academic level, by researchers who are all professors or holders of PhD – all of them active in publishing top quality research. Our program is suitable for students who already have a masters (or even a PhD) and want to switch to a research career and a PhD (or post-doc) on political ecology, environmental justice or degrowth. Students who already have a masters (or PhD) and want to proceed to a PhD (or post-doc) might also benefit by the option of taking selected modules of our program, as necessary for their needs, instead of the full Masters program. Our program benefits from the fact that it takes place in Barcelona, a city that is at the forefront of experimentation with the commons, social justice and alternative economies. We collaborate closely with the municipality of Barcelona and several of the civil groups and cooperatives active in the city. The students of our program will develop practical exercises and their theses in such organizations, enmeshing their work in the vibrant progressive culture of the city. Our pedagogy is based on group learning. Most of our professors are young and experiment with new methods of teaching, other than conventional lecturing. You will be asked to read and interact, but you will also experience knowledge through field visits, conversations with local people, work in local organizations and direct Action Research. You will learn how to work in groups, and you will develop most of your assignments and your final project in groups. A study by the ICTA-UAB and the UAB Department of Animal Health and Anatomy demonstrates that the main species hunted by the indigenous popoulations of the Peruvian Amazon ingest water and soil contaminated with hidrocarbons and heavy metals.